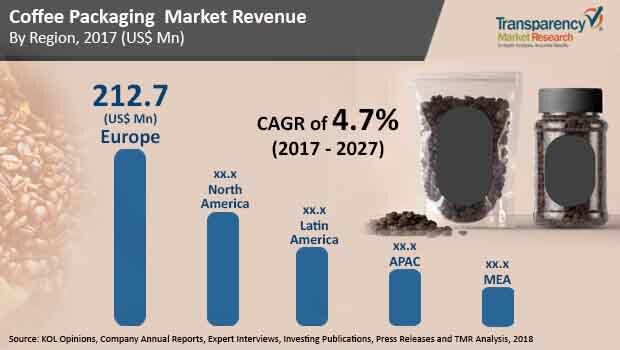 The global market for coffee packaging is likely to showcase a fragmented nature with the existence of a high number of players in the market, states a new study by TMR. The players in the market are giving emphasis to novelties in the packaging techniques, which is likely to support the development of the market in the next few years. The development of new products and the growing investments by companies for research activities are predicted to accelerate the market growth in the near future. The prominent players engaged in the coffee packaging market across the globe are Sonoco Products Company, Sixto Packaging, Amcor Limited, ProAmpac LLC, WestRock Company, Co Pack, Inc., Crown Holdings Inc., Mondi PLC, Goglio S.p.A., Pacific Bag, Inc., Bemis Co Inc., Shenzhen Packmate Packaging Co., Ltd.Novolex Holdings, Inc., DS Smith PLC, and PBFY Flexible Packaging. The global market for coffee packaging is emerging at a rapid rate. As per the research study, the market is predicted to register a potential growth rate over the next few years. Geographically, Europe is expected to account for a substantial share of the global coffee packaging market over the next few years. The remarkable rise in the number of people drinking coffee on a daily basis is considered to be the main factor accelerating the growth of the market in the next few years. The strict regulations for packaging is further predicted to ensure the development of the market in the near future. The coffee packaging market across Asia Pacific is anticipated to witness a positive growth over the coming few years. The global market for coffee packaging is expected to witness a promising development over the next few years. The rise in the number of people who are consuming coffee at a regular basis is one of the main factors that is predicted to ensure the development of the market in the coming years. The growing demand for coffee from restaurants, hotels, office cafeterias, and others is projected to support the development of the market in the near future. In addition to this, the leading companies in the market are emphasizing on innovations, which is likely to generate substantial growth opportunities in the next few years. Furthermore, the packaging industry has been going through several technological developments, which is likely to work in favor with the coffee packaging market over the next few years. The efficient and innovative packaging, which helps in keeping the coffee fresh for a long time and it is likely to directly impact the taste of the coffee beans. Also, the key players in the market are making ardent efforts to launch airtight, innovative, and attractive packaging for coffee, which is anticipated to accelerate the development of the market in the near future. The global coffee packaging market is predicted to witness a slight downfall in the growth of the market in the next few years. The rising preference of people to prefer fruit and vegetable juice and the rising number of people consuming tea are predicted to hamper the development of the market in the next few years. Nevertheless, the enhancement of the distribution segment and the development of new packaging techniques are estimated to enhance the development of the coffee packaging market in the near future. Among the regional segments, Europe is projected to hold a huge share of the global coffee packaging market in the next few years. Innovations and advancements in coffee packaging sector is likely to enhance the growth of the market in the coming years.